"Each month Perkulatte delivers you the most unusual coffee from all around the globe to your letterbox - saving you the hassle of dashing to the shop every time. What's more, the boxes are packed at the very last moment before delivery so the coffee beans always arrive as fresh as they can be - you can taste it. 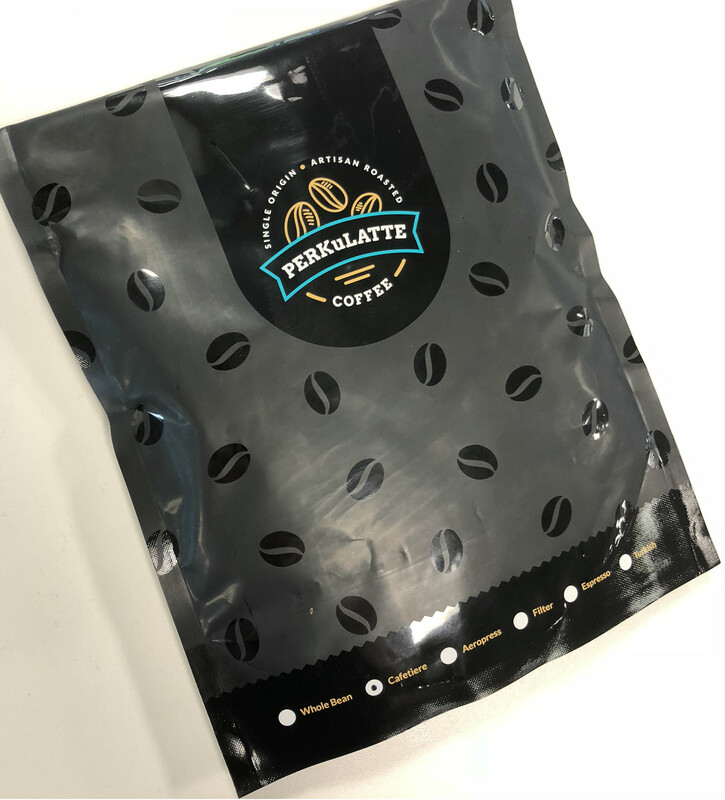 I was a big fan of the packaging that Perkulatte arrives in; a sturdy, sleek black sleeve - which gives off an air of luxury - it looks very classy in your kitchen! It's finished off with Perkulatte's branding and an insightful label on the back to provide you with more information about your monthly coffee. The label informs you where your coffee has come from, how it was grown, the delicious flavours it’s packing, and what strength it is. It’s nice to know where the coffee I’ll be drinking has come from! This month’s delivery was shade grown and washed in Peru, and I can look forward to "chocolate and sweet caramel notes" in each brew. The coffee bag is resealable to make sure it remains fresh throughout the month. I needed a cafetiere to enjoy this coffee, as I chose cafetiere grind, which is helpfully circled on the front of the packet. If you’re a coffee-enthusiast like me, you’ll probably have a cafetiere knocking around in your house already, but if you don’t, you can treat yourself to one. That said, they also offer whole bean, espresso grind, filter grind or AeroPress grind options. There’s also a sticker on the back of the packaging inviting you to ‘Share your coffee moment’ with the hashtag #perkulattecoffee. I really like the community feel of this and will definitely be browsing and adding to that hashtag later! The subscription box size is one 240g bag of fresh coffee each month. The volume remains the same throughout your subscription but each month brings a different type of coffee to those you’ve previously tried, so you get a lovely surprise to open every time! There are no options to choose your preferences on the coffee, which I think would be a useful option, but I’ve been so impressed with the taste of this month’s box that I’d happily let Perkulatte select my roasts for me again! A rolling monthly subscription to Perkulatte is £8.50 per month for a 240g bag of delicious fresh coffee delivered to your door, which is worth it for avoiding the supermarket hassle alone. You also have the option to pay quarterly, every six months, or annually - whichever works best for you. Perkulatte typically despatches four days after the 1st of each month and delivery is free which is another win. In summary, I love the fact Perkulatte delivers direct to my door and surprises me with different flavours and blends with every package - a nice surprise to enjoy every month that doesn’t break the bank! Likewise, I think it would also make an excellent and thoughtful gift for a friend or loved one with a coffee obsession. Furthermore, the team at Perkulatte strongly believe in Fair Trade, so they only deal directly with farmers and local roasters instead of resellers leaving me confident that the people who’ve made my delicious coffee are being fairly paid. I’ve tried a lot of coffee in my time and can be a little fussy (sometimes), but I was so impressed with Perkulatte’s delivery that I might let someone else do the choosing for me more often! The coffee itself was delicious, flavoursome and perfect for perking me up before a day at work. I think the price is reasonable considering every package is delivered to your house, free of charge. Plus, for me, the flavour justifies the cost, and I’d probably pay a lot more for a decent month’s worth of coffee in honesty!" Give your taste buds a coffee experience unlike any other with a Perkulatte Monthly Coffee Subscription Box. Fall in love with the world’s most unusual and amazing coffees. Get a taste for freshness today!